Congratulations! You’ve just joined the board of directors of a charitable nonprofit. If this is a new experience for you, you are in good company. Many businesses today encourage their staff to serve on nonprofit boards. You’ll share the experience of board service with individuals from all walks of life. A few of your fellow board members may already be old hands at nonprofit governance. A rarer few have attended workshops or studied some of the literature on nonprofit board governance. Many, however, are learning on-the-job…just like you. Perhaps your organization provided you with a comprehensive orientation to help you start your work on the board. Maybe you were teamed with a more experienced director who is serving as your mentor? With luck, you joined a superb board that’s filled with great role models. It’s not unusual to feel a little unsure of yourself at first. You should find the reception welcoming, as most nonprofit staff and directors relish the opportunity to benefit from the business savvy, strategic mindset, professional connections, and access to resources that directors from corporate backgrounds can contribute. Yet, I frequently hear complaints that all of those desired qualities seem to evaporate as soon as a business person is elected to a board. And I often hear business people describe their frustration with their board service. So here are a few insights about nonprofits that I’ve realized over the last 30 years — and a few tips to help make your board service more rewarding. Let me start with the insights. Nonprofits have a different bottom line. In business, the bottom line is easy to understand – it’s all about profit. Even if your business advocates a dual bottom line (social responsibility and profit), profit doesn’t take second place. In a nonprofit, there is no private inurement. The bottom line is the delivery of a public benefit – for example, an artistic contribution, environmental protection, or health promotion. Determining what that public benefit is, how to deliver it and how to evaluate performance isn’t always easy. Imagine you are on the board of an organization dedicated to the promotion of practices for good mental health. Can you concretely define what success looks like? What evidence would you point to? What changes would your small agency claim responsibility for? These are the challenges that will face you as a director of a nonprofit board. Nonprofits are valued for their prudence, commitment to service and fiscal restraint, yet are expected to produce significant community benefits. In the for-profit world, business owners are rewarded for taking risks – usually with other people’s money (venture capital). Under-capitalization is warned against. And a personality like Donald Trump is lionized for his opulent lifestyle and forgiven for past business failures. Not so in the nonprofit world. Here, individuals are expected to make sacrifices for the common good in the name of service. Making do with less is a familiar mantra. Pick up a business publication, and the virtuous charities are the ones with the lowest overhead. Meanwhile, nonprofits are being admonished to “act more like businesses.” In reality, most nonprofits are extraordinarily small, much more comparable to “micro-enterprises.” According to data available through the National Center for Charitable Statistics, over 80% of registered US public charities had annual revenues below $250,000 in 2004. At these smallest of nonprofits, nominally-paid staff or their volunteer leadership often have limited experience in nonprofit management and resource development — yet they are expected to operate as efficiently and effectively as multimillion dollar, professionally staffed organizations. It’s surprising that these tiny organizations get anything accomplished at all. But they do! From the neighborhood soup kitchen feeding the hungry to the volunteer land trust preserving hundreds of acres of open space to the volunteer ethnic organization staging an annual cultural festival for 20,000 participants, many tiny nonprofits are making significant and valuable contributions to their communities. Nonprofits are expected to consult with their stakeholders and to collaborate with their colleagues. It’s not unusual for business people to comment on the pace of decision-making that occurs at many nonprofits. Change may happen more slowly than they are used to. Because nonprofits are accountable to their community for doing good, stakeholders (like consumers, funders, politicians) expect to have some say in their functioning. If your nonprofit depends on public generosity for a sizeable portion of its revenue base, you need to ensure that your constituents understand and support the actions you take, or you put at risk their goodwill and continued financial support. Decisions and actions both big and small often rely on volunteers. If a nonprofit has no or limited staff, volunteers are performing much of the work. The biggest decisions of all – where to dedicate resources, what community needs to focus on, and what strategies to deploy – are made by volunteers, you, the board. Imagine your business self managing a motley crew of unpaid staff with varied levels of expertise, skills and experience. Family and work demands always take priority over their volunteer commitments. Managing volunteers requires all of the skills and tools you would use with your paid staff, absent one obvious and highly motivating reward – money. Get the idea of the challenges you face? Despite these differences, there are many experiences that nonprofits and businesses have in common. Whether for- or nonprofit, all enterprises need to be responsive to their marketplace. All enterprises need business acumen and effective operations to be successful. Quality research and information are essential for good decision-making. Ethical behavior and accountability maintain public goodwill. And every enterprise needs the structures, systems, people, skills, strategy and self-reflection that are essential elements of success. So, as a nonprofit director, how can you best put your business experience to work? Focus on the bottom line – the mission. As I said earlier, in a nonprofit, the mission is the bottom line. If you think of your community as your shareholders, achievement of your mission is the shareholder value that you’ve promised to deliver. However your nonprofit has committed to making the world a better place – by filling an unmet need, solving an important problem, creating new knowledge, or by increasing the level of joy or beauty for the people who live here – everything your nonprofit does should be measured against how well it is fulfilling that mission. Successful nonprofits also need the financial and other resources to get the job done. So while you focus on the mission, don’t forget to ensure that your organization has a well-developed capacity to obtain the resources it needs to keep moving forward. The fewer staff you have, the more likely that you, a leadership volunteer, will play a critical role in obtaining those vital resources. You wouldn’t think of starting a new company or making a major business decision without quality research to inform your decision. Yet, many nonprofit board members are tempted to make decisions based on their personal feelings or individual experiences. Do your research. Don’t conjecture. Seek out best practices and benchmarks. Keep up-to-date on issues affecting both nonprofits and your charitable mission. Ask for time at board meetings for education as well as action. Just like your business, your nonprofit needs your skills as an entrepreneur, a resource-getter, a strategic thinker, a people-motivator, or an organization builder. That’s why they recruited you. Apply those talents to your work on the Board. Ask board leadership for your job plan and annual performance measures. Just as you provide your employees with job descriptions and clear expectations for performance, you should expect the same of your board. What is it that you have committed to? What will you achieve during your term of office? What are your personal priorities? What resources do you have to work with? What relationships are critical? What are the limits of your position? How will you be evaluated? Be serious about legal matters. It’s tempting for volunteers, especially in all of those tiny organizations, to think – “those rules don’t apply to our little local agency.” Whether you are a $100,000 or $100 million nonprofit, you are similarly bound by federal or state statutes. Do you know your legal responsibilities as a director? Do you understand the federal, state and local regulations governing your nonprofit? Be vigilant about these matters. You may expose yourself to personal liability if you are negligent or willfully violate the rules. Hold core values of stewardship and ethical behavior. The nonprofit sector depends on the trust and confidence of the public for its existence. When a nonprofit violates that trust, it places the whole sector in danger of losing the unique privileges afforded to tax-exempt organizations. Nonprofits survive because they have promised the public that they will use their resources wisely for the community good and not for personal gain – the essence of stewardship. It’s easier to be ethical when you’re committed to wise stewardship. Combine an entrepreneurial attitude with patience. In their study of high performing boards, the international consulting firm of McKinsey & Company report that nonprofit leaders tell us that “when boards… devote time to providing expertise, helping managers get access to people and resources, and building managerial capacity, their organizations benefit the most.” At the same time, McKinsey and Company stated in a report on nonprofit capacity building that “almost everything about building capacity in nonprofits (and in for-profit companies) takes longer and is more complicated that one would expect.” Entrepreneurship and patience are important virtues. Last, but definitely not least, be courageous. It is not easy to be a good board member. It’s hard to rock the boat or risk offending business colleagues by asking questions that everyone else seems to be dodging, or by insisting on right but difficult courses of action. Even setting goals takes tremendous courage. But nonprofits need, no, they require the courage of board members. As Dr. Martin Luther King Jr. said, “the time is always right to do what is right.” It’s just not always easy. Good luck. Enjoy your board service. Gayle L. Gifford is a nationally known writer, speaker and consultant on nonprofit issues. 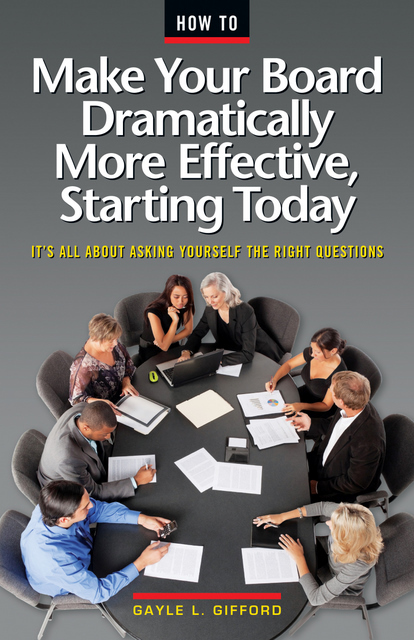 She is author of Make Your Board Dramatically More Effective, Starting Today. Gayle can be reached at gayle@ceffect.com or www.ceffect.com. This article first appeared in Nonprofit Boards and Governance Review at www.CharityChannel.com.